Freddie Mercury (born Farrokh Bulsara (Gujarati: ફ્રારુક બલ્સારા‌), 5 September 1946 – 24 November 1991) was a British musician, best known as the lead vocalist and a songwriter of the rock band Queen. As a performer, he was known for his flamboyant stage persona and powerful vocals over a four-octave range. As a songwriter, Mercury composed many hits for Queen, including "Bohemian Rhapsody", "Killer Queen", "Somebody to Love", "Don't Stop Me Now", "Crazy Little Thing Called Love" and "We Are the Champions". In addition to his work with Queen, he led a solo career, penning hits such as "Barcelona", "I Was Born to Love You" and "Living on My Own". Mercury also occasionally served as a producer and guest musician (piano or vocals) for other artists. He died of bronchopneumonia brought on by AIDS on 24 November 1991, only one day after publicly acknowledging he had the disease. Mercury, who was a Parsi born in Zanzibar and grew up there and in India until his mid-teens, has been referred to as "Britain's first Asian rock star". In 2006, Time Asia named him as one of the most influential Asian heroes of the past 60 years, and he continues to be voted one of the greatest singers in the history of popular music. In 2005, a poll organised by Blender and MTV2 saw Mercury voted the greatest male singer of all time. In 2009, a Classic Rock poll saw him voted the greatest rock singer of all time. 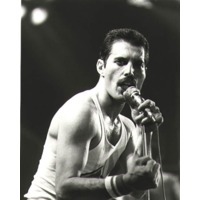 In 2008, Rolling Stone editors ranked him number 18 on their list of the 100 greatest singers of all time.Allmusic has characterised Mercury as "one of rock's greatest all-time entertainers", who possessed "one of the greatest voices in all of music".